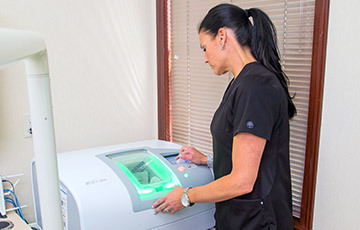 Dr. Davidson uses our digital 3D scanner and state-of-the-art CAD/CAM system to provide dental crowns in one visit. 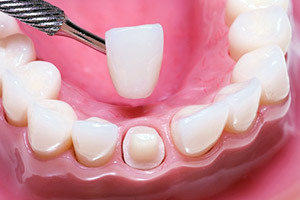 A dental crown is a tooth-shaped cap that fits over a natural tooth. It is used to restore a tooth that is decayed or broken-down. Dental crowns can also be used cosmetically to change the shape, color or length of your teeth. Our doctors use the state-of-the-art Planmeca® system for the computer-aided design and fabrication of perfectly fitting porcelain crowns right in our office. Our digitally fabricated crowns are made out of top-quality porcelain that is accurately shade-matched to the color of your other teeth for a completely natural look. Dr. Davidson is highly experienced in the use of CAD/CAM systems to provide one-visit dentistry. Dr. Davidson and Dr. Azary are both fully certified and highly skilled in the use of the Planmeca system to provide one-visit dental restorations. 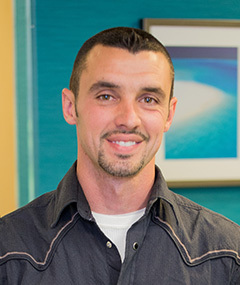 Dr. Davidson has been using computer-aided design/computer-aided manufacturing (CAD/CAM) technologies for dentistry since 1997, and is a certified dental CAD/CAM instructor. He has personally trained over 800 dentists in the use of this technology, and has been lecturing nationally and internationally on this topic for over twenty years. 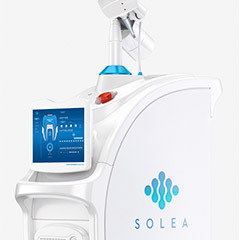 The Planmeca system uses digital technology for everything from impressions of your teeth to the final adjustment of your new computer-designed and manufactured crown. Because of the speed and accuracy of the procedure, your crown can be designed, fabricated and placed in as little as two hours. 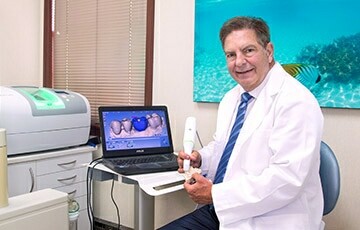 The doctor first takes an impression of your teeth using a 3D digital impression scanner. Digital impressions are not only more comfortable than traditional impressions using gooey paste, they are more accurate as they capture all surfaces of the teeth without any distortions. Computer-aided design software allows the doctor to design a perfectly fitting crown while you wait. Dr. Davidson or Dr. Azary can make detailed adjustments to your virtual tooth using Planmeca’s advanced design tools to create a crown that will fit perfectly. The doctor will select a shade of porcelain that precisely matches the color of your adjacent teeth. When all design steps are complete, the final design for your new crown is sent to our in-office milling unit. Our in-office milling system allows us to fabricate your crown during the same visit. Our milling unit precisely fabricates your new crown out of a single block of high-quality porcelain. The specific type of ceramic we use is highly compatible with the human body and has the same characteristics as natural dental enamel. It expands in the same way as natural teeth do in response to temperature changes, and because the crown is milled from a single block, it is less prone to cracks and flaws than other types of restorations. With lab-created crowns, any small final adjustments needed to ensure a perfect fit would have to be sent back to the lab, which would necessitate another appointment. Using the Planmeca system, Dr. Davidson and Dr. Azary are able to make final adjustments right in our office in a matter of minutes. 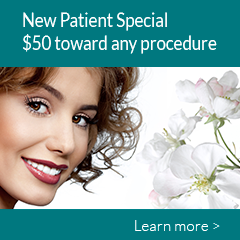 You will be able to walk out of our office with your permanent, final crown in place at the end of your visit. Fast: With Planmeca, we can create your high-quality, final restoration in just one visit, whereas patients usually have to wait for up to two weeks for a lab-manufactured crown. Natural, aesthetic appearance: Your crown is fabricated out of a high-grade porcelain ceramic that resembles natural tooth structure, resulting in a beautiful, natural-looking restoration. Strong and durable: Planmeca dental ceramic allows for strong and durable restorations that are highly resistant to cracking and breaking. Biocompatible: The all-porcelain material in the Planmeca system is metal-free and nontoxic. It expands and contracts in response to temperature changes in the same way that natural tooth enamel does. Economical: Planmeca restorations are more affordable than traditional lab-manufactured crowns. The Planmeca system can also be used to create high-quality onlays and inlays, which are restorations used to repair damage to your tooth that is too extensive for a filling but does not require a full crown. Inlays are placed in the grooves between the cusps (highest points) of your tooth, and onlays are fitted over one or more cusps. As with our crowns procedure, our doctors use the Planmeca system to precisely and accurately design, fabricate and place onlays and inlays in a single visit. New tooth-colored CEREC ceramic restoration.